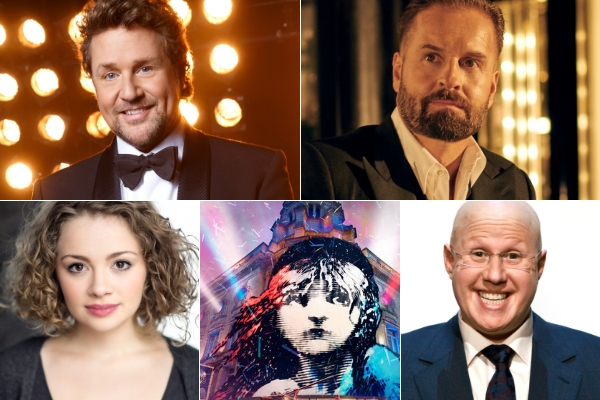 Cameron Mackintosh has announced that for 16 weeks only Michael Ball, Alfie Boe, Carrie Hope Fletcher and Matt Lucas will lead a large cast and orchestra of over 65 in the concert version of Les Misérables. Katy Secombe also joins to play Madame Thénardier and for three performances a week, the role of Jean Valjean will be played by John Owen-Jones. Further casting will be announced shortly. This spectacular staging of the legendary concert, previously seen in London at the Royal Albert Hall and the O2 Arena, will run from 10 August to 30 November 2019 at the intimate Gielgud Theatre next door to the current home of Les Misérables at the Queen’s Theatre. Cameron Mackintosh said: “I am thrilled that the plan to keep Les Misérables running in London with a staged concert version on Shaftesbury Avenue during the enforced closure period has attracted such a stellar cast, with Michael Ball, Alfie Boe, Carrie Hope Fletcher, John Owen Jones, Matt Lucas and Katy Secombe, who all have a very close personal connection to the history of the show. The original London production currently at the Queen’s Theatre (following runs at the Barbican and the Palace Theatre) will play until 13 July 2019 when the theatre will then close for four months of rebuilding work. The restored Queen’s Theatre will reopen in December of 2019 with a new production of Les Misérables continuing its run indefinitely, with a new West End company being put together now.